When two musical worlds collide, something special happens. A fusion of pop and trance music is exactly what the brand new single of Armin van Buuren, together with Sophie Ellis-Bextor, represents. ‘Not Giving Up On Love’, combining the best of both worlds, is the second taste of his ‘Mirage’ album. The follow-up to the more dance floor-oriented ‘Full Focus’ is a warm, melodic blend of pure feel-goodness. Sophie’s vocals blow you away from the very moment she hits the first note. After the first, original release, that included remixes by Jorn van Deynhoven and Dash Berlin, Armin now presents his very own club remix of the track, along with an interpretation of Canadian producer Glenn Morrison and house approach by Dutchman Mischa Daniels. 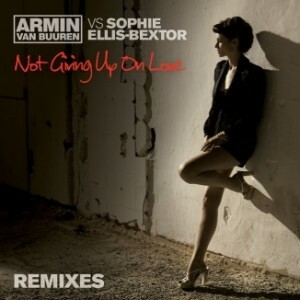 Though the original and album version was already danceable from first till last beat, it’s Armin’s deeper and more electro-feel remix of ‘Not Giving Up On Love’ that draws you in completely. It shines a different light on the track, making it more dramatic and fit for the peak-time moments on the floor. The long-awaited club version of the track that’s currently haunting the summer festivals and club parties around the globe. Glenn Morrison, prog-virtuoso by heart, stayed close to the track’s original surroundings, but also explored a more synth-driven, progressive-trance way to dancefloor mayhem. His remix brings out the tenderness and fragility of the track – without ever making it lose its power. Last but not least, Mischa Daniels, who’s about to release his debut album, brings out a clean-cut house remix, fresh from the studio and ready to make you move.